We had to travel great lengths to an undisclosed location, some where in the middle of.... lets say Mexico for legality sake. It was a nice little ride up to ...Mexico where we found some really sick power line trails and decided to hit them up. Little did we know that it would take just about all day to get where we needed to go. but of course first we had to ensure we were properly prepared in case a bear jumped out of the woods and attacked us. Bear>Jeep soft top. This poor random wheel was peppered to death in our pursuit of bear security awareness. I got Audet with a nice shot on the shotgun. He seemed very pleased and was ready for a bear attack now. Now to the trails. Of course first down every hill is Audet and his crazy Zeep. He loves the zeep in a tough love kinda way so we just let him go first to test the waters (sometimes quite literally). We hit the trails, the first little hill seemed a little tuff but after that it looked like clear sailing. Down the hill Tim's newish Land Rover Discovery V8 rolls its way down. Tim is also the guy who owns this 350z here. Towards the bottom of the hill, Devin and his $1000 pathfinder with a little 3 wheel action. 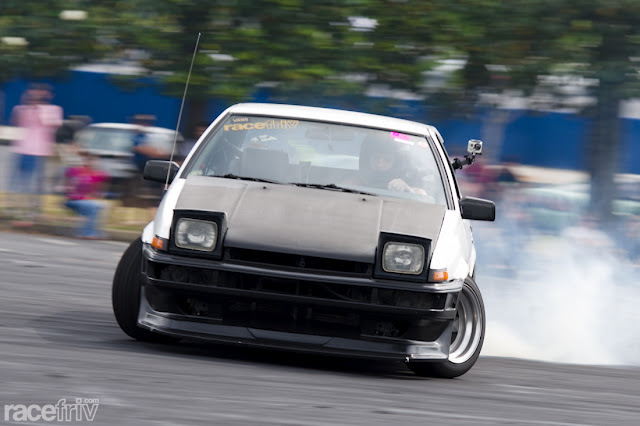 Devin is also the guy with the other white ae86 you see around here from time to time. As we made it down the hill I put the Jeep in a ditch then promptly drove right out of it. Not even a scratch. ok maybe a couple of scratches. Since this was a frequent place that ...Mexcians.... seem to take their 4x4's there were a few trails to choose from when climbing the many hills. Some beginner-like, some not so much. It was a pretty vast route. However a lot of the time there was only one way, and every vehicle had to man up and make it. There was no way a tow truck was coming out this way. When I think of the Land Rover makes I can only picture them driving through water for some reason. Its their natural habitat. The zeep about to get a drink from the local water hole. Devins brother Alex came along for the ride with his pathfinder as well. I have to say that these old pathfinders are just badass. I was more and more impressed with them the further we drove. I would like to see if anything Nissan makes these days can compete with these old pathfinders. It was at this point we realized there was no going back the way we came, we had to press forward until we found another way out....of Mexico that is. The camera man view... dont worry im having just as much fun. So here is where we got to the hard part. It was the last hill we would have to tackle and it was by far the worst/best hill we encountered. There were two paths, one was a long round-about way with a grand canyon in the middle of the road. The other I promptly named Stone Mountain because it was about as steep as the flat side of the Stone Mountain it self. Since the Ruby was probably the most likely to get up it. I drove up first with no issues then took pictures of everybody else making their way up. Contact your local racefriv work shop for Gas can rigs and other modification needs. First up was Devin and he struggled a tiny bit but made it with no issues, at this point I was quite proud of that old beater. It was a Top Gear moment to say the least. Audet took the grand canyon path and got stuck, that ditch you see there crossed the road at some point and there was no avoiding it. Luckly the only vehicle that had a wench is the only one to get stuck this day. Tims Landy also mad it up the hill with out too much effort. That Landy, though it may be heavy and British, it looks damn good climbing some mountains. That zeep aint looking to bad either and Audet knows it. Then we spotted a ...mexican power plant off into the distance. We had really come a long way at this point. All in all I have to say Im super proud of the Ruby and super glad I finally got to take her out on some difficult terrain. I had an absolute blast this time out, so between all the drifting and car shoots and shenaninginns expect to see some more RFOF (racefriv offroading, I know its kinda lame but RFOF is fun to say) in the future. Thanks to everyone that came out we will have to do it again super soon!!! and Thanks for reading everyone! Yeah and I bet they grow some damn fine peaches in "Mexico"